Super Hero Boy: Who says I can't be a skateboarder? Who says I can't be a skateboarder? Ok, confession time. There is one thing I wanted to do SO badly when I was growing up and though I tried my little heart out and even have some scars to prove it, I could never master skateboarding. Jump tiny horses over things bigger than I am, no problem, but ride a board with wheels.. not happening. I did however spend an awful lot of time nursing wounds on all my guy friends who could actually skate, which I guess is good enough. Thanks to Tony Hawk Ride I can now at least pretend I can skate. Ride is a really unique video game. Using a controller shaped like a skateboard you can now actually stand and "skate" your way through a Tony Hawk game. Though I can't particularly say its exactly like the real thing, certainly its far safer as if you loose your balance and fall off your Ride board vrs a real skateboard it certainly hurts a lot less. It is much easier to master though I still have problems with the tricks. The game itself seems a little unimpressive compared to most Tony Hawk games. It's a bit more basic with smaller levels. I'm sure a lot of that had to do with programming the new Ride controller but it was a tiny bit disappointing. However, the fact that there is now a skateboard controller gives future games much more options and it's really exciting as to how the controller can be used for other games as well. All in all if I wasn't comparing the new Ride game to previous Tony Hawk games its an impressive design and the controller though a bit hard to master at first is really quite challenging. It's also a great game to add to your list if your looking for a workout as it will keep you quite active. I almost hate to say this but if your kids are begging for a skateboard and your still not so sure that its a great idea it's also a great alternative. Especially for the cold rainy days we've been having lately! 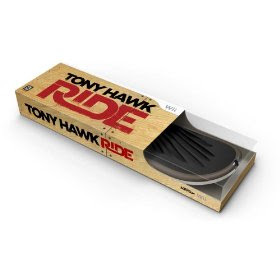 Tony Hawk's Ride is available right now and you can pick up yours on Amazon! My 10 year old really wants this game! !